Department of Orthopaedics, D.Y. Patil Medical College & Hospital, Kolhapur, Maharashtra, India. Background: The ACL avulsion injury is more common as compared to PCL avulsion injury, and also it is easier to treat it arthroscopically. ACL avulsion can occur in all age groups. The anterior drawer test is positive in these patients, indicating the anterior instability. Our method of treatment is by 24G SS wire with figure of “8” loop having tension band effect. Method: 30 patients randomizedly out of 50 patients were selected that were performed in last 5 years from 2011 to 2015. 3 anterior portals i.e. 1 anteromedial, 1 anterolateral and 1 transpatellar tendon portal were used. In all operations,it was tried to keep optimum physiological tension in ACL. Results: Patients were followed up for 6 months. 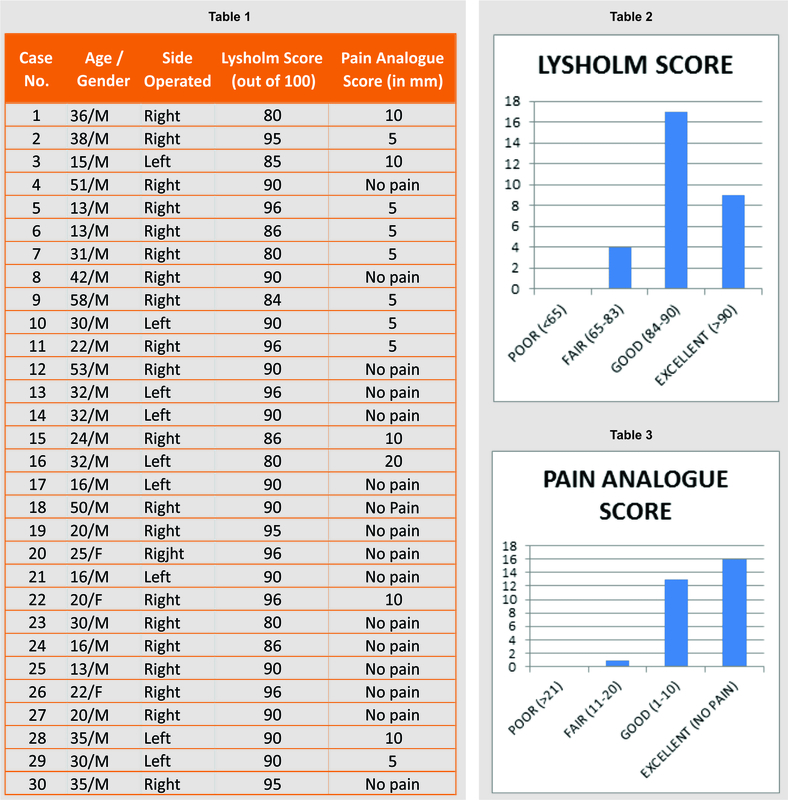 Lysholm Knee Score and Pain Analogue Score was used. Conclusion: ACL avulsion fixation being performed total arthroscopically, giving tension band effect, is less invasive procedure giving good to excellent results. Keywords: Arthroscopy, ACL avulsion, tension band wiring. The high velocity trauma in recent era has complicated the ligamentous knee injury status. The incidence of ACL bony avulsion injury is increasing, associated with or without other ligamentous injuries. ACL avulsion is relatively common injury in adolescents as well as adults. Many different methods have been tried to preserve ACL This new method of fixing ACL avulsed piece of bone with ligament to anteromedial tunnel by a tension band technique is interesting and worth following as the post operative results are good to excellent. This method is even useful in non union of ACL avulsion. The anterior drawer test becomes negative on table. The proper tension in ACL intraoperatively can be monitored in this method. It is thought that either ACL or PCL avulsion even though it is old, it should be salvaged and not reconstructed, unless the effort of salvage fails. The proprioception is much better in naturally preserved ACL than the reconstructed ACL. 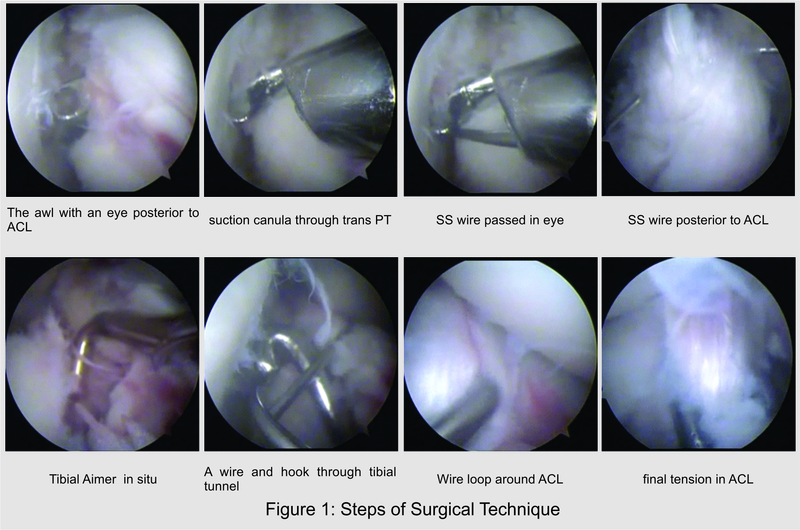 Reason of publishing this series is to encourage the research on ACL and PCL preservation. Keeping in mind, the avulsion injury is not only a bony insult of the joint, but also it is osteoligamentous trauma. So it needs anatomic fixation and it is equally important to keep the optimum physiological tension in ACL at the end of the surgery. Proper stabilization as well as early mobilization is the aim of the surgery. Our tension band effect can allow atleast passive assisted bending of the knee and preserve the mobility of the joint. This retrospective trial was performed from 2011 to 2015. All the patients with isolated ACL bony avulsion injury and patients with ACL bony avulsion injury with meniscal tear were included. The patients having associated PCL tear and/or MCL tear and/or posterior lateral corner injury were excluded. Procedure: With routine arthroscopic technique, taking anteromedial and anterolateral portal, a thorough joint inspection is done. Then attention is drawn at the intercondylar notch. The ligamentum mucosum is sacrificed and the area around the avulsed bony piece is shaved. Sometimes the avulsed bony piece is lifted up. That piece is reduced and the area around the ACL is cleared off with the shaver. Then the arthroscopy portal is changed to anteromedial. A malleable need awl with an eye is introduced through anterolateral portal and it is pushed posterior to ACL. Then the eye of an awl is noticed coming on the medial side of ACL. A 3rd transpatellar tendon portal is prepared with a K-wire guidance. Then a suction canula is introduced through this portal, towards the eye of an awl. Then a 24G SS wire is passed through the canula in the eye. The awl is taken out from the anterolateral portal. So this wire now encircalages the ACL. With tibial aimer, 2 tunnels are prepared parallel to the patellar tendon through tibia towards these wires, near the avulsed piece of the bone. The medial wire is taken out from the lateral tibial tunnel and lateral wire taken out from medial tibial tunnel. Finally the medial wire is taken to the lateral wire under the patellar tendon. The wire is tightened by pulling it and twisting it. At the same time, the tension inside the ACL is monitored with the help of the hook and when an optimum tension is reached, the twisting is stopped. At this stage, anterior drawer test becomes negative. Then the stability is confirmed and it is not hampered by gentle passive flexion and extension of the knee. The patients were followed up at 2 weeks, 6 weeks, 12 weeks and 24 weeks postop. Lysholm Knee Score and Pain Analogue Score was measured in each of them. According to the score, the results were analyzed. All the operations were done by the first author, who is a senior surgeon working in our department. The results of this series were measured with Lysholm Score and Pain Analogue Score. The loss of knee flexion and the extension lag was critically assessed during the follow-ups of these patients. In the present series, 6 patients had restriction of terminal knee flexion ranging from 5-20 degrees. This restriction is reflected in their respective Lysholm Score which has been mentioned in the table below. The extension lag occurred in 2 patients out of 30 patients. The duration of immobilization in extended position has caused invariably arthrofibrosis in the anterior compartment resulting in restriction in terminal flexion. To avoid the restriction in terminal knee flexion passive assisted knee mobilization at weekly interval was given to them. The extension lag was because of the pain in anterior compartment of the knee even after 6 weeks. The anterior drawer test was weakly positive in 3 patients out of 30. Out of 30 patients, 9 patients were of the age group of 26-35 years and 14 patients were of the age group of <25 years. Considering the male and female ratio, 90% of the patients were male. The Lysholm Knee Score was graded as per the Tegner Lysholm grading1, 6 which is as: <65 is poor, 65-83 is fair, 84-90 is good and >90 is excellent. According to this grading, 9 patients of our series were found with excellent result and 17 patients having good results, indicating 86.66% of patients showing good and excellent results. The Pain Analogue score was categorized in millimeters and graded them as: No pain is excellent, 1-10 is good, 11-20 is fair and >20 is poor. In our series, 16 patients had excellent and 13 patients had good result, indicating 96.66% patients having good and excellent results. In July 2012, Oh Soo Kwon et al. published Arthroscopic treatment of ACL avulsion in skeletally immature patients in Korea Catholic University5 .Similar study was done in 2011 in department of Orthopaedic Sugery Vanderbilt Unversity Medical Centre USA by Christian N. Anderson . In 2011, displaced ACL was fixed by Arthroscopic staple fixation by S R Sundarrajan in Coimbatore, India . In 2014, Achilleas Boutsiadis et al. described Arthroscopic 4 point suture fixation of ACL tibial avulsion fractures . This procedure has been started long back in 1995-96 when mini arthrotomy was performed and used to loop ACL under direct vision. By 2001this procedure was started under arthroscopic control but wasn’t published till 2012. In the recent literature since 2010-2015 the tibial spine fracture has gained importance because of the frequency of the injury in young athletes. This injury is common in athletes between 10-15 years age group and ignorance in treating them have resulted in disabilities in young athletes 67% patients in our series are in age group between 15-35 years, suggesting that the injury is also common in young adults. Oh Soo Kwon et al. has thoroughly analyzed the problem of ACL avulsion injuries in paediatric age group and derived different procedures like 4 strand suture configuration using push lock anchors . The other methods like using staples or cancellous screws without crossing the epiphyseal line have also been tried by different authors with limited success. Recently thread loop fixation with 5 No. Ethibond also have been tried with reasonable success. When mini arthrotomy technique was used in 1995-2001, it was found that the whole avulsed piece of bone has to be detached from tibia to loop a SS wire over it. But in our arthroscopic technique we can just pass the wire posterior to ACL by an awl with an eye as described. So this procedure is less invasive as compared to mini arthrotomy procedure. In our arthroscopic procedure we push medial side of the wire laterally and lateral side of wire medially, ultimately twisting them anteromedially and anterolaterally. This forms a figure of 8 loop and acts as a tension band giving all advantages of tension band fixation principles. The rest of all other procedures which have been described so far are not giving the benefit of tension band and maintaining the appropriate tension in the ACL by sufficiently twisting the SS wire. The complication of excessive deeper anchoring (countersinking) of ACL by giving disproportionate tension in the SS wire can be avoided by careful arthroscopic observation of ACL bony avulsed piece which should not be sinking too much while twisting the wires. The similar technique was used between the age group of 13-15 years. In these patients the epiphyseal fusion was already started and it was anticipated that mere introduction of 24 gauze wire will not insult the epiphysis. The SS wire is ultimately removed in these patients within 3-6 months under arthroscopic control. Butit is totally agreed, with lesser age group than this, some other procedure respecting the epiphyseal line should be used. In our procedure after giving physiological tension in the ACL and fixing the avulsed bone piece with figure of 8 tension band, the Anterior drawer test becomes negative intra operatively on the table. Now the importance of passive assisted knee flexion by the surgeon at weekly interval , is beneficial to get range of motion in these patients is understood. Immobilizing these patients in complete extension for 6 weeks will cause arthrofibrosis in the anterior compartment. After 4 weeks brace is removed and start active and passive exercises and on 6th week weight bearing is started. The use of rigid internal fixation may allow more aggressive rehabilitation in an attempt to minimize stiffness. 1. Arthrosc Tech.2014 Jun; 3(3):e377-e382. Published online 2014 Jun 9.doi:10.1016/j.eats.2014.02.005. 2. Achilleas Boutsiadis, Dimitrios Karataglis, Filon Agathangelidis. Arthroscopic 4-Point Suture Fixation Of Anterior Cruciate Ligament Tibial Avulsion Fractures.Arthrosc Tech 2014 Dec;3(6):e683-e687. 3. SR Sundararajan, S Rajasekaran and S Leo Bernard. Displaced anterior cruciate ligament avulsion fractures: Arthroscopic staple fixation. Indian J Orthop.2011 Jul-Aug 45(4):324-329. 4. Christian N.Anderson, Allen F. Anderson. Tibial Eminence Fractures. 5. Oh Soo Kwon, Atul F. Kamath, John D Kelly. Arthroscopic Treatment of an Anterior Cruciate Ligament Avulsion Fracture in a skeletaly Immature Patient. Orthopedics . July 2012-vol 35.issue 7:589-592. 6. Tegner Y, Lysholm J. Rating systems in the evaluation of knee ligament injuries CliOrthopRelat Res 1985;(198):43-9. How to Cite this article: Kulkarni PG, Bothara NV, Kulkarni S, Bhagat S. Arthroscopic Tension Band Wiring For ACL Bony Avulsion Injuries. Journal of Trauma and Orthopaedic Surgery. Jan – March 2017;12(1):3-6.